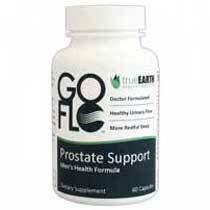 GoFlo is a supplement that is made by the company True Earth Health Products and designed to help support a healthy prostate gland. The prostate, a walnut-sized gland present in a males, can become enlarged with age causing a number of health-related problems. One particular problem is associated with the urinary tract and flow of urine. Because the enlarged gland squeezes the tract, the male can find himself with the constant urge to go to the bathroom and the inability to completely empty his bladder when there. Not only is this annoying but it can also lead to other more serious problems too. Go Flo helps these issues by slowing the growth of the gland, keeping the flow of urine strong and the urinary tract healthy. The product is sold from the official True Earth Health Products website which includes a great deal of additional information about the prostate for consumers. In addition to the FAQ section they show information on what to ask the doctor about the prostate gland and what to look for in a good supplement such as GoFlo. GoFlo is said to be a high quality product that works effectively in supporting a healthy prostate gland. Although there are no testimonials shown for the product, the website provides information about the doctor who developed the formula and the ingredients used. GoFlo can be purchased directly from the website and consumers are offered several buying options. They can choose to get one bottle, a one month supply, at a cost of $39.95, which is less than the regular price of $59.95, or purchase a three month supply for deeper discounts. The manufacturer recommends this as they state it can take up to three months for users to see full results, although some men have reported relief within just 30-60 days. GoFlo has a full 60 day money back guarantee. GoFlo Ingredients – Are they Safe & Effective? The complete ingredient label for GoFlo is shown on the product website and the individual ingredients are explained in full, which is very helpful for consumers unfamiliar with this type of product. The formula uses some common prostate health ingredients that include the Phytosterol Beta Sistosterol, used to help improve urine flow, Pygeum Bark Extract, which helps reduce the number of nighttime bathroom visits and increases urine volume and Stinging Nettle Root extract which also boosts the flow. Zinc is an essential mineral that regulates prostate cell growth, supports healthy prostate tissue and maintains male reproductive health. The key active ingredient used in GoFlo, however, is Flowens, a substance comprised of Cranberry fruit powder. The cranberry is known for its positive effects on urinary health and its ability to keep the lower urinary tract functioning at its peak performance. The cranberry used to make Flowens has been reengineered and ‘optimized’, making it pure and of the highest quality. All the ingredient information includes links to further research and it is said that they all have a long history of ‘therapeutic’ use. What are the Advantages of GoFlo? What are the Disadvantages of GoFlo? GoFlo is the type of supplement that would be best taken as a preventative measure, or by someone just experiencing the first signs of prostate problems. It is always best to consult a doctor if there are any major concerns regarding the prostate, but certainly, taking a supplement such as this will help keep the gland as healthy as possible while preventing it from becoming larger. The use of Flowens in this formula is definitely a positive aspect of the brand, giving it an edge over products that only use Beta Sistosterol and Pygeum Bark as their main ingredients. Prostate health is of great concern for men today. Preventative measures may reduce the risk of developing prostate cancer and improve overall prostate health and function. A quality, premium prostate supplement may shrink the prostate, minimize frequent urination, promote sexual function and contain quality ingredients. Below you’ll find some of the most effective prostate supplements on the market today, in our opinion. Read about The Top Rated Prostate Supplements of the Year 2019.